“This is the Al-Aqsa Mosque that Adam, peace be upon him, or during his time, the angels built,” the mufti said of the 8th-century structure commissioned by Caliph Abd al-Malik ibn Marwan. Hussein has held the post of mufti since 2006; he was appointed by Palestinian Authority President Mahmoud Abbas. He has previously endorsed suicide bombings against Israelis. A guide to the Haram al-Sharif, as the Temple Mount is known in Arabic, published by the Muslim Waqf in 1924 also mentioned the presence of two Jewish temples atop the Jerusalem compound in antiquity. At least four inscriptions from Herod’s Temple, destroyed by the Romans in 70 CE, attest to the presence of a Jewish temple atop the 37-acre platform he had engineered over 2,000 years ago. One of Hussein’s predecessors as chief custodian of the Jerusalem holy site, Hajj Amin al-Husseini, made headlines recently after Prime Minister Benjamin Netanyahu charged in a speech that the Palestinian Muslim leader inspired Adolf Hitler’s Final Solution of exterminating the Jews. Netanyahu took flak from Holocaust scholars, politicians, and even the German government, who pointed out that the extermination of Europe’s Jews was already in full swing when Husseini met Hitler in 1941, and that there was no concrete evidence to support that charge. 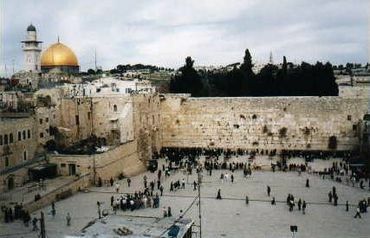 The Jerusalem holy site has been the focus of recent violent clashes between Israeli security officers and Palestinian rioters, and ostensible plans by Israel to change its status, repeatedly denied by the government, have been a catalyst for a wave of Palestinian terror attacks on Israelis. While Jewish visitors are allowed to enter the site, Jewish worship is banned under arrangements instituted by Israel when it captured the area from Jordan in the 1967 war. Israel and Jordan agreed Saturday to placing CCTV cameras on the Temple Mount in a bid to calm tensions and monitor possible violations of the status quo, a move rejected by Palestinian leaders. Muslims will do or say anything to try to give their religion credence and to lie their way to try to hide the past and the truth! The Palestinians claim The Al Aqsa Mosque is Islam’s Third Holiest Shrine Is this the Truth? Muhammad said he had a DREAM that he ascended to heaven from the Temple Mount. What a bunch of disgusting dimwits these dregs of the world are. mohammeds night Journey on the winged donkey (some say mule) with a womans face , was not to Palestine, rather it was to Medina. It began at the Al-Haram Mosque, and the journey ended at the mosque of As’ad ibn Zurarah in Medina. The details of the journey of the Hijra [that’s Muhammad’s escape by night from Mecca to Medina] are the very same details of the Night Journey, the Isra, because the Night Journey of Surah 17:1 is indeed the secret Hijra. Shil, I love your sense of humor.